Solar Water Heater information and a solar hot water system DIY project. Solar hot water options for homeowners. A solar water heater will save you big bucks on hot water. 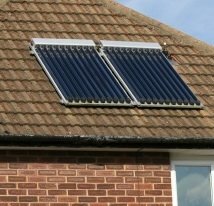 Look at solar water heating options if energy efficient hot water is on the list of green upgrades you're considering for your home. Solar hot water means more green for the planet... and more green in your pocket, too! Investing in a solar water heater is a win win situation. The planet breathes a little easier and you save money - as much as one third - on your power bill. Solar water heating systems are simple designs that rely on the sun to heat the water and super insulated tanks to store it. You can even make your own solar water heater for next to nothing (video demonstration below). More sophisticated designs are available online and we'll link you to some of our favourites. Inexpensive and environmentally benign, a solar water heater will pay for itself repeatedly in the coming years. Additionally, tax incentives, rebates and other money saving programs exist in most developed nations for establishing any energy efficient hot water heater. Economical - some would say cheap. Short Pay Back Time - Depending on the type of solar hot water system you choose it'll pay for itself in 3 to 7 years. After that you'll have free water heating for many more years. No operating costs (unless you add a pump to the system). Removes pressure on the existing power infrastructure in your community. Heating water with solar takes a significant load off of existing infrastructure. Over a 20 year span, using a solar hot water system can displace over 50 tons of carbon dioxide that would otherwise have been released into the atmosphere. Approximately 30% of your household energy bill represents water heating costs. More if you have a heated swimming pool. Taking your water heating needs off the grid removes pressure from your existing energy infrastructure. As demand for energy increases in municipalities, existing infrastructure can become overburdened and unable to keep up with demand. Some municipalities have adopted a routine of rolling brownouts (times of the day where energy is rationed) to avoid having to go the the considerable expense of expanding their facilities and their output potential. Building new power plants to address the demand is very expensive not to mention a move backward when, internationally, the mandate is to clean up our energy act. It's less expensive and more progressive to encourage residents (with incentives and rebates) to switch to clean, green, energy sources. Check for local and federal incentives in your area. Pay back time is from 1 to 6 years depending on a number of variables. Cost of the system is from $1,000 to $3,500, again, depending on some variables. An active, glazed system will cost the most and produce between 80 and 100 gallons of heated water daily. Passive solar hot water systems cost less but produce less hot water and pressure is reduced. 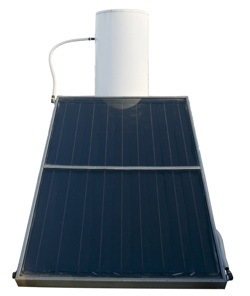 A solar power water heater is capable of reaching temperatures of 82 degrees celsius (180F) . (pictured at right) look more like a solar panel - flat, rectangular and covered with glass - than unglazed. Constructed of more expensive materials (copper), glazed panels are more durable and can be coaxed to function in below freezing temperatures. They're also the more expensive choice. Sunlight passes through the non reflective glazing panels and collects on a dark absorber plate behind the glass. Tubing is looped back and forth under the glass next to the dark plate and through the tubing circulates air, water or an antifreeze solution. As the fluid or air in the tube warms, it moves off to a well insulated storage tank or is used immediately. water heaters consist of lengths of black hose or pipe which is exposed directly to the sunlight (no glass cover). The pipe is usually coiled or looped into a compact unit that is placed in a sunny area preferably on a black surface (the more heat, the better). Water fills the pipe and the heat that the black pipe collects is then transferred to the water. The hot water can be used directly from the unit or directed to an insulated tank for storage. If the collector is situated on a roof or other elevated structure the hot water can be accessed by gravity (another free source of green energy). In climates where temperatures never dip below freezing an unglazed solar water heater will probably meet all of your requirements. Here's a great video on assembling an unglazed passive water heater. Minimal materials are needed to assemble this easy DIY solar hot water system. Use it for your home water supply or to heat a swimming pool and start saving money right away.